In the early textile industry of the area, wool was the main fibre used - changing to cotton in the 1800s. Sheep that were kept here were Lonks and other upland sheep; we know that Lonks were kept by Whalley Abbey. The wool from these sheep was too course to be used for garments and it was sent to Rochdale as “they didn't deserve any better”. Wool of a much finer quality was brought in from other areas e.g. Lincolnshire, to be used in our textile industry producing Kerseys. From the early 1800s, the industry changed to cotton, importing the cotton from America, and this lasted until the whole industry collapsed in the 1970s. The American cotton was produced using slaves and when Gamaliel Sutcliffe travelled to from Hebden Bridge to America in 1867, after the civil war, he saw for himself the destruction of the cotton fields in Mississippi - "The cotton plantations on both sides look seedy and uncultivated (the effects of the war). Some of them are of immense size. The owners, at least those who have got a few dollars left, are just beginning to prepare for a fresh crop." There is just one manufacturing shop left in Hebden Bridge itself – that of trouser makers on Melbourne St and Brisbane Moss at Eastwood continue to manufacture corduroy and moleskin. Pecket Well weaving shed closed in 1998 and the last spinning factory in Halifax closed in 2009. Most British wool now goes to the carpet industry with clothing being made using imported wool mostly from Australia and New Zealand. There used to be 32 wool scourers in Europe - there are now just two left, in Bradford. Most wool is sent to China to be cleaned as it is cheaper to do that than have it cleaned in this country. There are signs however that there is a resurgence of the wool industry in this country with new spinning factories opening up across the UK, very often with machinery bought in from Yorkshire! Hainsworths of Pudsey, near Leeds, is one woollen factory that has survived. It is still manufacturing cloth and has done since the 19th century – carrying out all stages from cleaning the wool to dyeing the finished fabric - they still 'full' or felt the fabric. Whilst they produce traditional fabrics, some very similar to what was originally produced here, they are also working at the cutting edge of the woollen industry – making the fabrics for Kevlar vests for the police and highly technological fabrics for the fire brigade. Most of their wool is brought in from Australia and New Zealand. Most of the wool they use is imported from Australia and New Zealand, with the exception of the woollen coffins they make which are made from 100% UK wool. In addition to clothing, wool can be used for many other products, from carpets to piano felts. All sheep farmers who keep more than five sheep are obliged to send their wool to the Wool Marketing Board in Bradford. A sheep farmer gets an average of £1.50 a kilo from the Wool Marketing board. 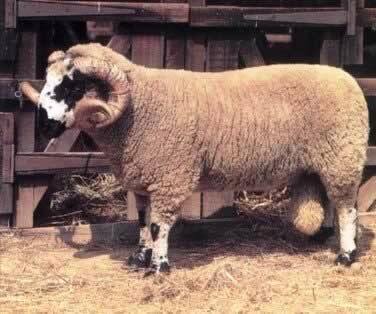 A sheep produces from 2 - 5 kilos per shearing, local sheep producing about 2 - 2 1/2 kilos. You can see that it is very dificult to make this pay.